Whether for agility, obedience, rally, dock diving, search and rescue, Schutzhund, IPO, hiking or for fun, teaching your German Shepherd to jump is an important part of his foundational training. You can start training your German Shepherd the basics of jumping as a young puppy, using poles on the ground, or uprights with no poles. German Shepherds should not jump higher than six inches until at least 18 months of age. Check with your dog’s breeder or veterinarian for the go-ahead to jump higher. Once your German Shepherd’s growth is complete, you can start him on jumps. Start off low — set the bar an inch or two off the ground. I prefer to teach my dogs to jump without using a leash. I find the leash causes the handler to get in the dog’s way, or is used to drag the dog over the jump. At best, you risk the leash getting caught in the jump and knocking it down. At worst, the leash gets caught in the jump and pops your dog’s collar, or drags the jump, which could scare her. Your dog will need to know two skills before learning to jump without a leash: Leave it and Stay. You will practice Leave it and Stay with your dog every time you do jump training, so don’t worry if she doesn’t do them well at first! Keep your first several jumping sessions short and fun, using low jumps. You will gradually raise the height of the jumps as your dog becomes more confident. I use an oxer (two-bar spread) jump like the one featured in the video. I place a toy or bowl of treats a few feet after the jump, to teach the dog to jump round, quickly and straight. If you don’t have enough equipment to create an oxer, a single jump with a pole on the ground will do. You may use guide poles to help keep the dog straight. Or, a fence or wall to one side with whatever artificial barrier you can create on the other, will also work. I always reward my GSD for looking straight over the jump before releasing or rewarding him. This is a technique from Susan Garrett’s fantastic agility training DVD, Success With One Jump. Place the treat or toy a few feet after the jump, and tell your dog to “Leave it.” Be sure the reward is centered as you look at the jump. You don’t want your dog to jump crooked trying to get to the toy! Bring your dog a few feet in front of the jump and ask him to stay. I like to feed these stays almost every time, to get the dog accustomed to waiting until I release him to jump. You may stay with your dog after you ask him stay, or walk a few feet away, then release. Practice sometimes returning to your dog to feed him a treat, instead of releasing. This will prevent him from anticipating your release. You will need to adjust the dog’s distance before the jump, as well as the reward’s distance after the jump, for higher jumps or multiple jumps in a row. If your dog is doesn’t want to go over a jump, go back to using a pole on the ground, or use two uprights with no pole. Practice asking your dog to stay, and then release him through the uprights to the treats or toy. You may need to move the bowl of treats between the uprights at first, and put your dog close to the jump, so he can be successful. Encourage your GSD with lots play between jumps, and an excited tone of voice. As your dog progresses, try different jump configurations and distances. See Agility Nerd’s List of One-Jump Drills and Susan Salo’s Jumping Grid Workbook for ideas. Is Your Dog Ready For Agility Training? 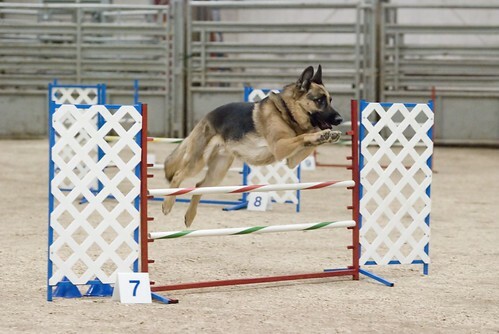 Agility training is a wonderful, energy-burning and mind-challenging sport for German Shepherds and their handlers. Even German Shepherds not registered with the AKC can participate in agility competition, thanks to a plethora of agility registries such as the United States Dog Agility Association and the North American Dog Agility Council. Finding a good agility class or trainer can take some time, but is a fairly simple process. But how do you know when your dog is ready to start training for agility? Before you being any new training or sport regimen with your dog, take note of his or her current physical shape. Is he the correct weight and eating a high-quality diet? Are his vaccinations current? Does he have any health problems that might interfere with running, or jumping? When in doubt, it is best to have your dog checked by your veterinarian before you begin. Keep in mind that puppies, especially large breed puppies, shouldn’t do any serious jumping until their growth plates have closed — usually between 12 and 18 months. Again, ask your veterinarian if in doubt. While agility is often great fun for dogs and handlers alike, there is no question that it requires a higher level of training than does say, hiking, or a game of fetch. If your dog has never taken a training class of any kind, you may want to complete a basic obedience course before attempting agility. Some agility instructors will accept dogs with no training whatsoever, but most recommend the dog at least know how to sit or lie down on command and come when called (at least some of the time)! If you’re feeling confident you can train your dog to a basic level without a class, some of the resources listed below may be helpful. Want to know a little more about teaching your dog to jump safely, quickly and accurately? Jumping from A to Z: Teach Your Dog to Soar is a good introduction to any dog sport that requires a lot of jumping, and agility is no exception. Puppy owners can get the most out of their future agility star with the video Sirius Puppy Training , or the book Positive Puppy Training Works (good for puppies of all ages)! Don’t worry if your dog isn’t quite ready, or isn’t able to compete in agility trials. There is plenty of time to prepare a young dog for his or her first trial. And older or less mobile dogs can still compete in agility for fun — ask your vet, trainer or club members about agility fun classes and matches. Happy running!